Fair Winds Press, 9781592338610, 192pp. Satisfy your whole family with nourishing meals they’ll love. 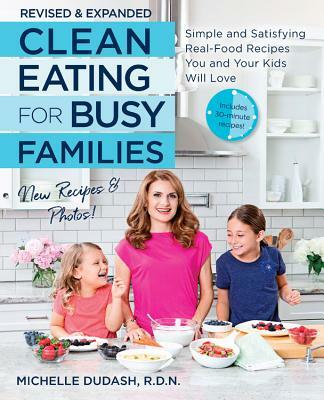 In this revised and expanded version of the top-selling Clean Eating for Busy Families, you'll find even more recipes and photos, streamlined weekly grocery lists, and practical tips for healthy family eating. All parents know what a struggle mealtimes can be—you want to prepare healthy dishes for your family, but picky eaters, busy schedules, and way-too-long cooking times and ingredient lists always seem to stand in your way. Clean Eating for Busy Families takes the challenge out of putting delicious food on the family table on a nightly basis by providing you with a clear plan for dinner success. It’s Quick: From easy sautés and casseroles, to slow cooker and one-pan meals, all the recipes you’ll find inside list both mode and length of cooking time, so there’s no time wasted trying to calculate the timing for your schedule. Plus, most recipes can be prepared in 30 minutes or less! It’s Clean: The ever-growing “clean food” movement, which focuses on a healthy, whole foods-based approach to eating, lies at the foundation of this book, so you can be sure you’re feeding your family the very best. From wholesome ingredient lists to nutritional analysis on every recipe, you can feel confident that every meal you prepare is both nutrient-rich and calorie-conscious. Options for plant-based, gluten-free, and dairy-free alternatives are also listed wherever possible. It’s Green: Featuring eco-friendly tips, along with information on how to go green while shopping and cooking, you’ll find it a cinch to keep your family happy and stay eco-conscious. And most importantly…it’s delicious! From Orange Peel Chicken & Broccoli Stir-fry with Brown Rice to Baja Fish Tacos with Pico de Gallo and Summer Berry Slump with Vanilla Greek Yogurt, you’ll enjoy night after night of delicious home cooking—without any of the hassle. Get started creating new and exciting dishes for your family today! Michelle Dudash, RDN, is an award-winning registered dietitian nutritionist, Cordon Bleu-certified chef, contributor to Food Network’s “Healthy Eats” blog, healthy recipe columnist for The Arizona Republic, and television personality. Her recipes and articles have appeared in Men’s Journal, Diabetic Living, EatingWell, Shape, SELF, and Better Homes and Gardens. She is frequently quoted in publications such as Women’s Health, The Washington Post, WebMD, Forbes, Today, Bon Appetit, Prevention, Family Circle, Woman’s Day, and Women’s World and has appeared nationally on “The Doctors,” “The Chew,” “The List,” “FOX and Friends,” “Better,” “Cavuto,” and Radio Disney. Michelle has cooked at a Mobil Five Star restaurant and was a private chef serving guests including English royalty. She graduated from the University of Wisconsin-Madison with a bachelor of science in dietetics, and a few years later she earned her toque from Le Cordon Bleu College of Culinary Arts in Scottsdale, Arizona. She lives in Carmel, Indiana with her husband and two daughters. Visit Michelle online at www.michelledudash.com or on social media.